BOM / DOH / IAD - will operate a daily SAME PLANE service effective March 30th 2008 using a two class configured B 773ER. QR will start using their B 773ERs daily to LHR from August 2008. 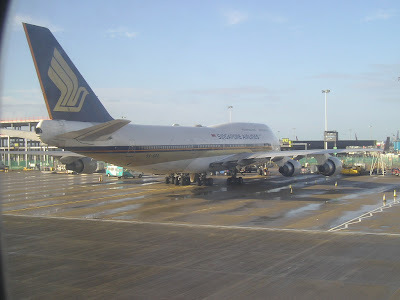 However, from October 2008, it will be used to LHR 12 times a week. DOH / GVA / EWR - increased to 6 weekly flights i.e. 1 A 333 + 5 weekly A 332s. DXB - reduced from 8 to 7 daily flights. KHI - capacity increased to daily A 321s. LHE - frequencies increased from 2 to 3 weekly A 330s. ISB - frequencies doubled from 2 to 4 times a week i.e. 2 weekly A 330s + 2 weekly A 320s. BOM - capacity increase from daily A 330 to daily B 773ER. HYD - frequencies reduced from daily to 6 weekly A 320s. MLE - capacity increased to 9 weekly A 330s. FRA - capacity increased to 9 weekly A 333s + weekly A 332. MUC - capacity increased to 6 weekly A 333s + weekly A 332. CMB - capacity reduced to 12 weekly A 320s + 2 weekly A 330s. KTM - capacity reduced to 9 weekly A 320s + 2 weekly A 332s. CEB - frequencies increased from 3 to 4 weekly A 330s. CDG - capacity increased to 7 weekly A 346s + 5 weekly A 330s. ZRH - capacity increased to 3 weekly A 333s + weekly A 332. TXL - capacity increased to 2 weekly AB6s + 5 weekly A 320s. It is really nice to see QR trying to carve out a nice little niche market for itself by offering "same plane" service from BOM via DOH to IAD. Hopefully, it shall have a positive impact with regards to loads and yield on their IAD bound flights. Another interesting feature of their summer 08 timetable are the increased number of weekly flights flown to LHE & ISB. This goes to show that the airline has successfully lobbied in obtaining more traffic flights for the lucurative Northern Pakistan routes. DXB - increased to double daily nonstop flights using a B 773A from May 1st 08. MAA - an additional 11th weekly flight is flown using a B 773A. HAN - frequencies increased from daily to 10 weekly B 772As. SGN - frequencies increased from 17 weekly to triple daily B 772As. ZRH - frequencies increased from daily to 10 weekly B 773ERs. PEK - capacity increased to double daily B 773As + daily B 772As. SIN/BKK/KIX - increased from 5 weekly to daily B 772As. EVA Air has announced that it will be reducing its presence at LAX-Los Angeles by reducing its weekly frequencies from 20 to 19 effective March 30th 2008. From July 2008, BR will fly 6 times a week to LAX from TPE via KIX-Osaka using a B 773ER. It will be the only airline flying KIX-LAX-KIX nonstop. British Midland is seriously scouting the market for used B 762ERs and used B 763ERs as it feels that the A 320s and A 321s that it currently uses on the ex BMED routes to Africa and Central Asia are too small to meet market demand + they cannot carry extra revenue generating cargo in the belly. BMI also revealed that its new business strategy is to "Look East" to expand rather than risk a bloodbath by rapidly expanding trans-atlantic operations which would lead to a fares war. This is a smart move by BMI to base its medium/long haul expansion around the emerging markets of Central Asia, South East Asia and the Middle East. They are members of Star Alliance so instead of wasting money by flying their own aircraft to multiple cities from LHR, they can easily codeshare with fellow STAR partners i.e. UAL & US Airways on their LHR-USA-LHR flights. With regards to the ex BMED routes, some like TAS, ALA and IKA see flights flown by A 320/A 321s which at times suffer payload restrictions if the route is flown nonstop or they are routed via another city. This diluted the revenue and marketing feasibility of operating the flights. For Central Asia and West Asia flights (BEY/DAM/AMM), the ideal aircraft for BMI to use would be the B 762ER. Boeing has officially confirmed that the state of Vietnam has confirmed placing an order for 12 Boeing 787-800s. Four of those aircraft will be bought by Vietnam Airlines where as the remaining 8 are being purchased by VALC (Vietnam Aircraft Leasing Company) who will dry lease the planes to VN. Finnair has revealed details of its new Asian route i.e. ICN-Seoul which will be flown nonstop from its HEL-Helsinski hub effective 2nd June 2008 using an A 340-300. The flight will be flown 5 times a week.